Why are you leaving so early again, dear winter? 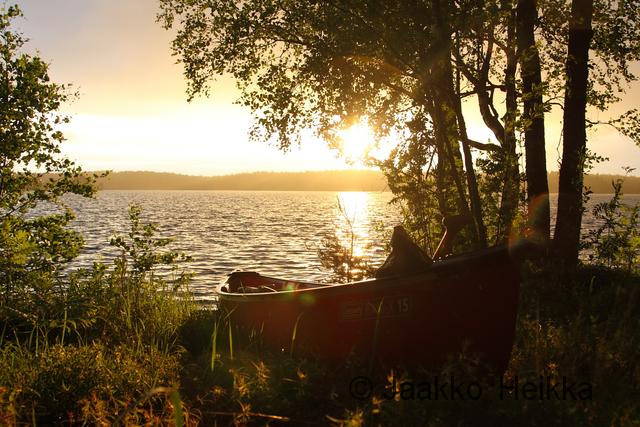 It seems that it’s time to say farewell to the winter who is leaving the Southern Finland too early again. Way too early. 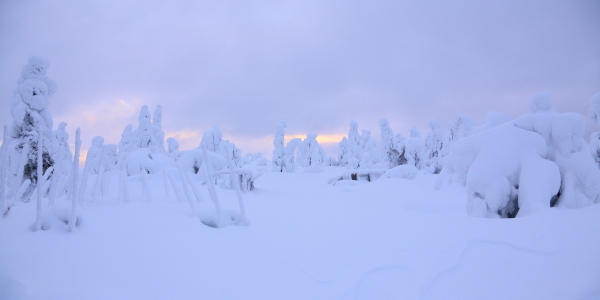 The winter here was short but not as bad as the previous one either: We had a decent amount of snow and the lakes did freeze but the temperatures zig-zagged around zero… But it was still pretty good winter. 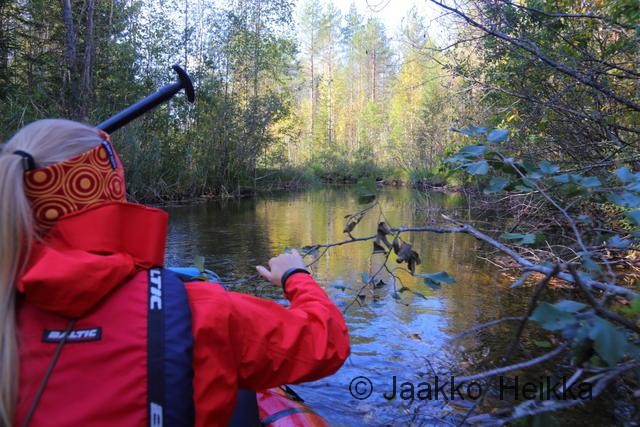 Most of my time outdoors was spent on guiding and instructing the Ankarat avotunturit courses. The time in between was spent mostly doing administrative work and preparing for what is to come. 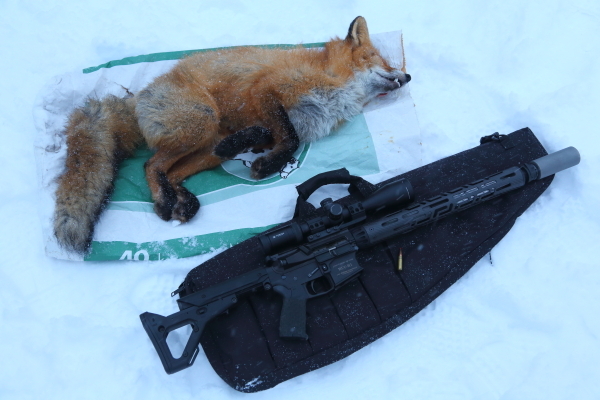 My outdoor year started with some hunting in early January and included spending a night in open (though not public, but still free to use if you find it!) wilderness hut. 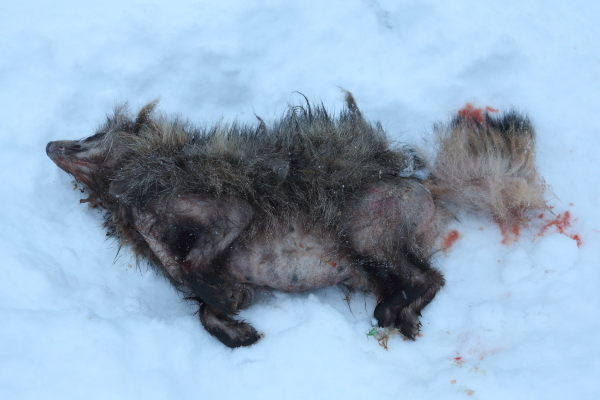 My friend got the fox and an hour later I shot the manged raccoon dog. 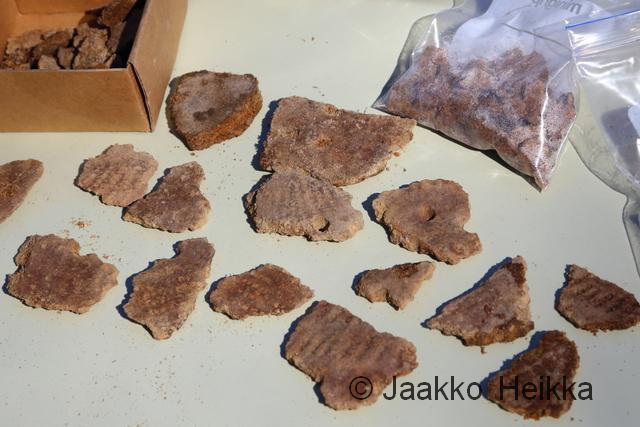 Traditional sit and wait hunt with not-so-traditional tools. No luck with hare the following day but a great start for the year anyway! 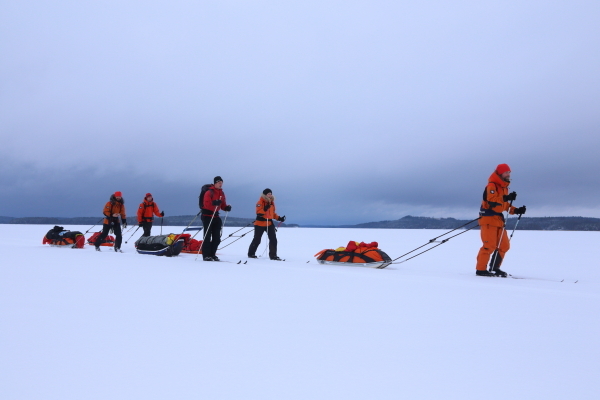 The first Ankarat avotunturit introduction course was held at the Syöte National Park. 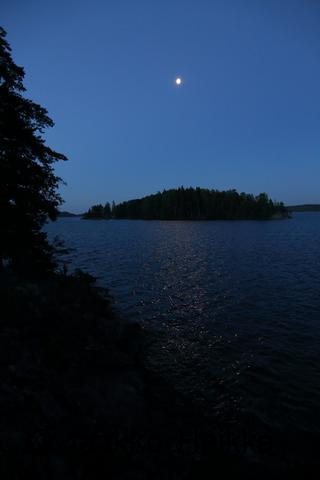 It’s a great location with open marsh plains and deep spruce forests framed by rolling hills. And with a guarantee of snow! On the course we skied from the visitor center to Toraslampi and back spending a rather wet night in tents. Thanks to Hotel Iso-Syöte for the course venue! Then I had two more introduction courses. 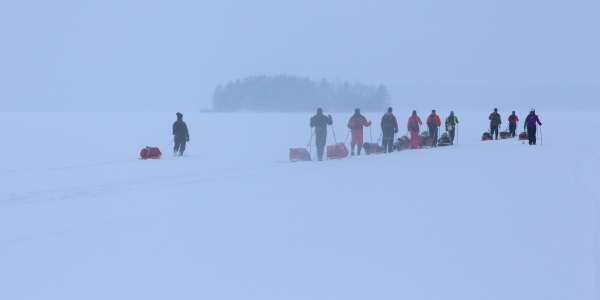 First at Taipalsaari skiing on the frozen Lake Saimaa. 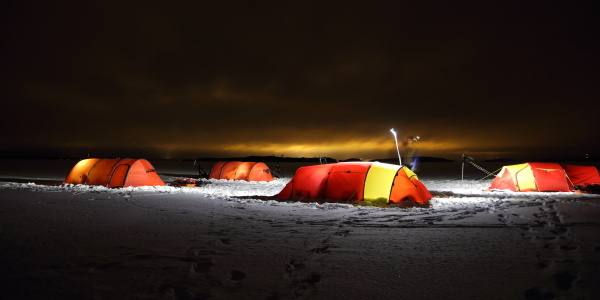 Again mild temps, wet snow and a fair wind in the evening which added a bit of challenge to pitching the camp on the ice. Good training. 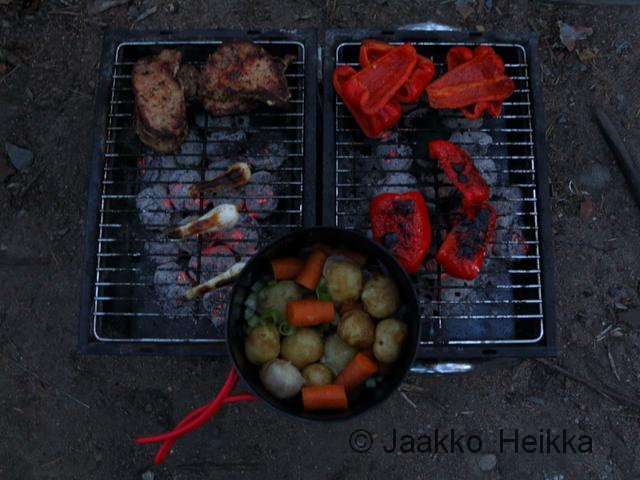 The second course was again at lake Päijänne but this time at Jämsä. 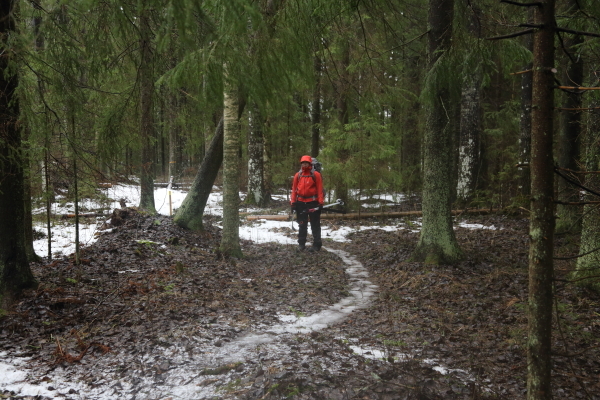 Conditions were very familiar: overcast, mild temps and a bit of wet snow. The kind of winter we’ve had. Luckily I had a nice group of wilderness guides, students and teachers to add a bit of colour to the otherwise grey conditions. I was also instructing on the Ankarat avotunturit special courses related to safety training and first aid and expedition medicine. You can read more about them and see a few photos in the Avotunturit blog. 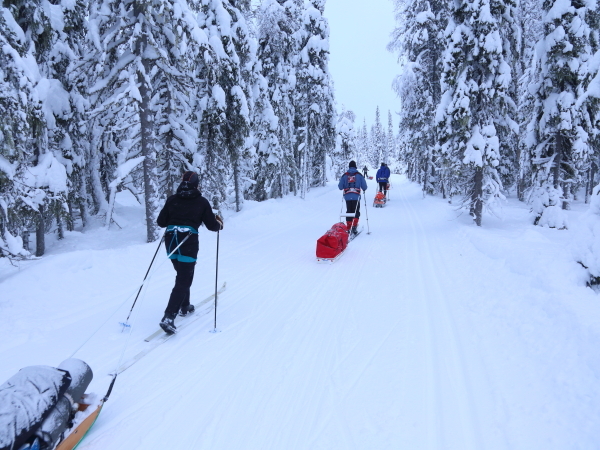 So, late on Saturday afternoon we packed the gear and headed to the ski track walking trough the dark slushy streets and drizzle. The winter seemed to be about to leave. 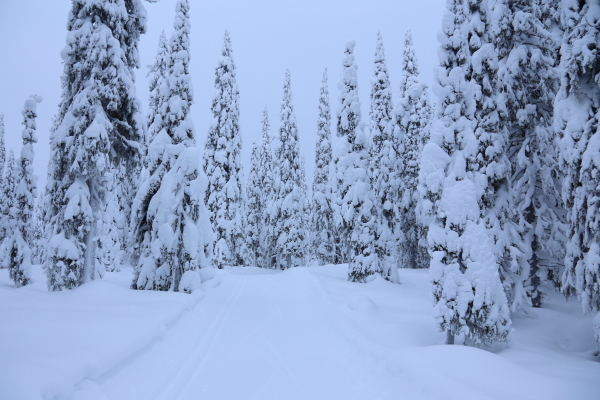 The groomed track to Riutta was easy going but from Riutta there was no groomed ski track marked on the map. Just the signs of summer trail “Ilvesreitti” (click “Kesäretkeily”, “Retkeilyreitit” and “Riihimäen reitti”), but we assumed it would take us to the right place and after some open streams, road walking, forest walking and even a bit of skiing we found ourselves at the first shelter and called it a day. 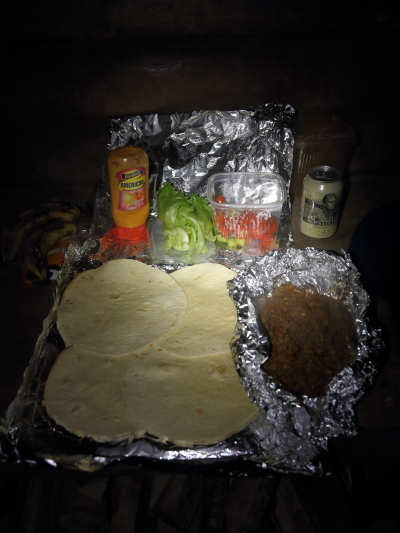 Nice dinner by the camp fire followed but the night was slightly uncomfortable as I had to sleep on me side because the benches at the shelter were too narrow for me to sleep on my back… Clearly ment for day visitors only. The morning welcomed us back on the trail with more rain and occasional shower of snow. 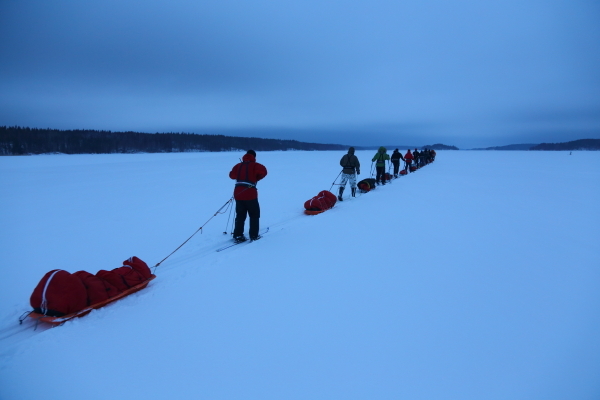 In the daylight route finding was easier and we could ski a bit more but still had to walk every now and then to spare our skis. 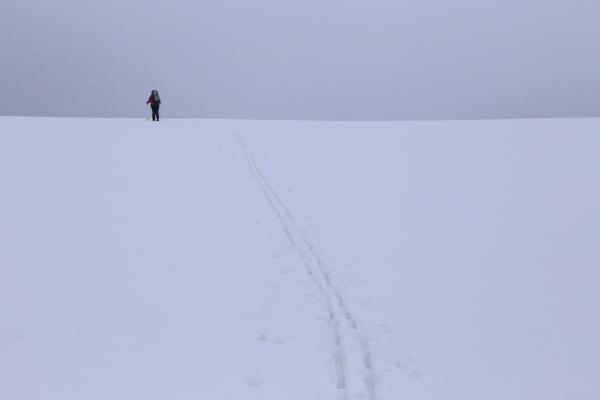 The snow was melting fast and the next week the only places to ski in would be the prepared tracks and open fields. We were back home wet and with new scratches in our skis but happy none the less. The most important thing is to get out! So, I managed to fulfill the first two months of the #twonights challenge! 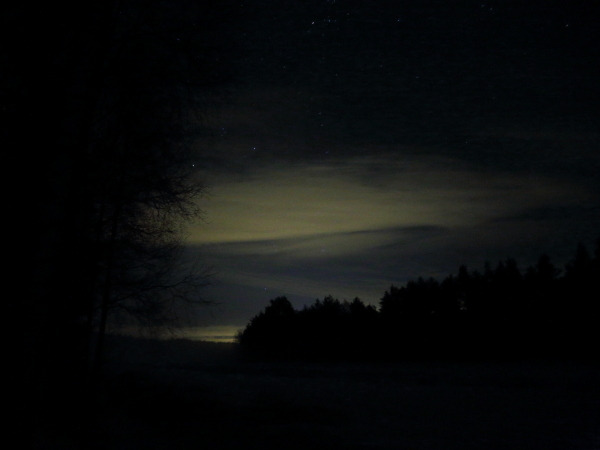 Six nights in January (counting the 31.1.-1.2.) and two in February. And even though the challenge is “closed”, you are still free to join for peer support and pressure to make sure you get a healthy dose of nights outdoors every month! So it seems like it would be time to say farewell to winter. Hear this winter, I’m not finished with you yet! There is no mountain so high, cave so deep or wilderness so cold that I wouldn’t find you! I’ll start from the fjells of Sarek in early March. And should you try to escape, I’ll be searching you from the cold shores and jagged peaks of Spitsbergen in April. And I’m pretty sure that in May I’ll find you from the glaciers of Iceland. I’m not finished with you yet, winter! Another overnighter trip report! Sorry, if you are getting bored. I’ll try write about kit/gear/stuff later, and of course finish the posts about the past winter. But for now, trip report it is! 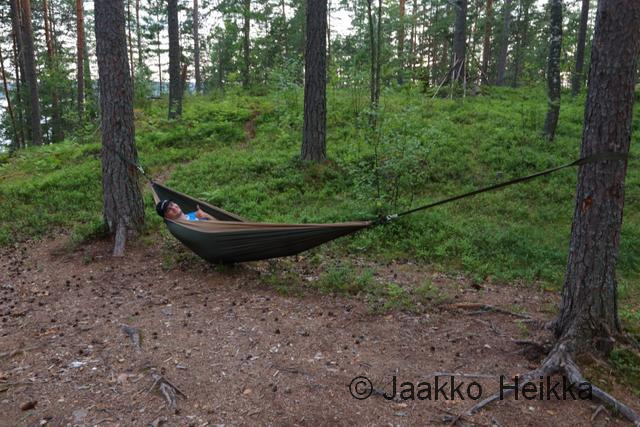 My original plan was to spend the festive mid-summer weekend, Juhannus as we call it, working and I really didn’t have any other plans for the weekend. But things change. 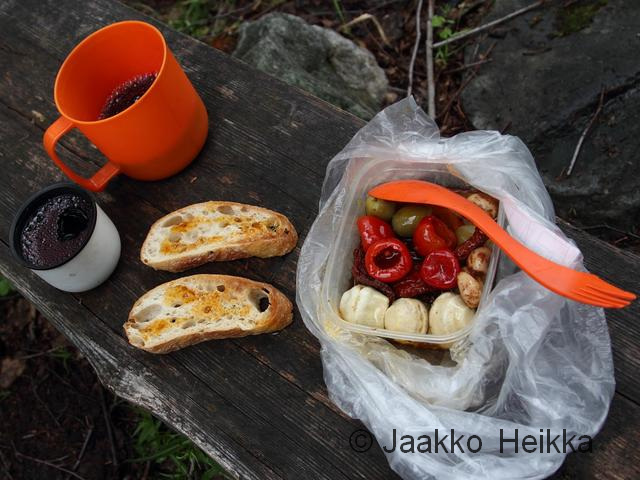 And when I found I had no work to do I though of it as a possibility to consume less and be more outdoors. Suits me. 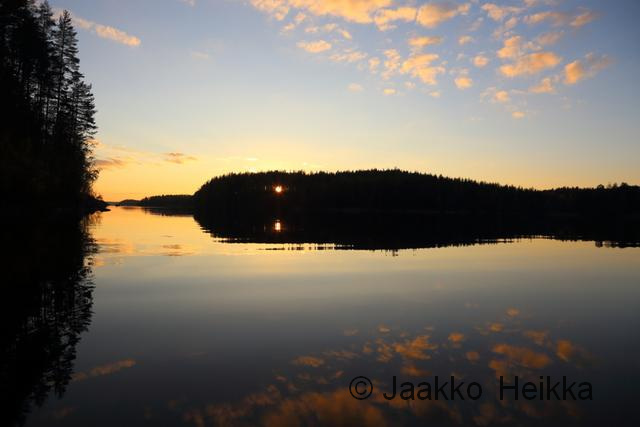 As the weather forecast was good I quite quickly came up with a nice trip idea I named “summer solstice solitude”: borrow friend’s kayak, paddle around the western Pien-Saimaa area and search for a tiny islet to spend the shortest night of the year. I even borrowed Hilleberg Soulo tent to have a free-standing tent with a small footprint to fit on the tiniest of rocky islets. 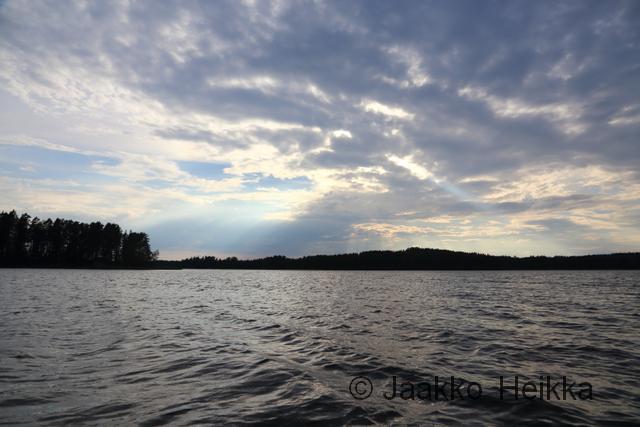 I got on the waters a bit after 17:00 after a substantial energy level boosting in the form of meat pastries stuffed with additional ham and egg (local specialty called “vety”) with my brother at the Lappeenranta harbour. 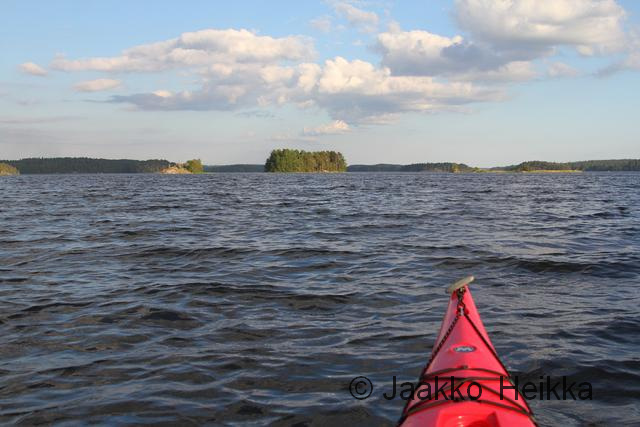 The weather was gorgeous and the kayak glided nearly effortlessly across the calm waters. Going was good and I felt confident even though this was my first time on a solo kayaking trip. 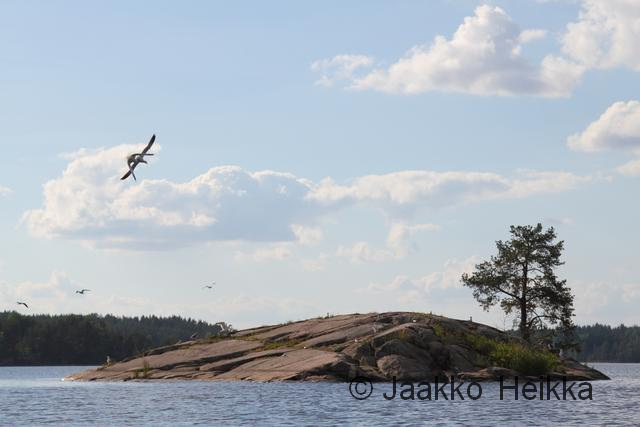 I had some small islets in mind but I soon found that I was a month or two late booking my place for the night as angry seagulls had already booked all the nice little islets. 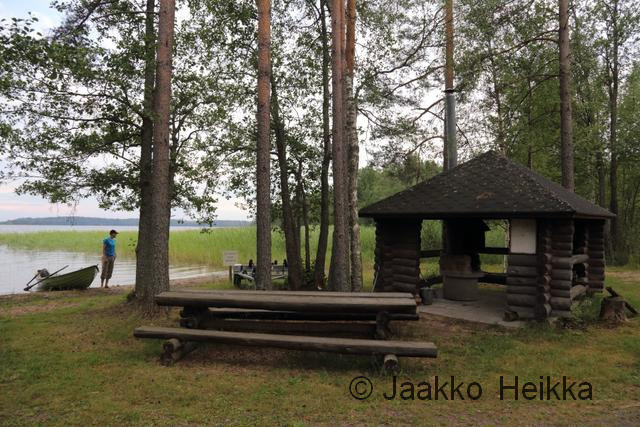 And of course most of the bigger islands were littered with summer houses, now occupied with people spending the mid-summer weekend in the traditional Finnish style: cottage by the lake, friends, sauna, barbecue, big bonfire and getting drunk. With less seagulls and little lower water level this would’ve made a great camp! As I wanted to have a bit of solitude and an island of my own I kept searching. After couple of hours of kayaking my feet started to fall asleep. 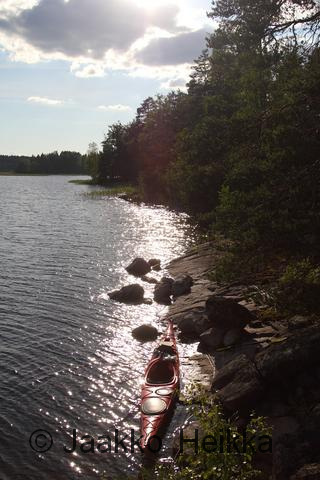 The borrowed kayak was a little bit too tight fit for my well-trained bottom so I decided to have a little beer break and get the blood flowing again. 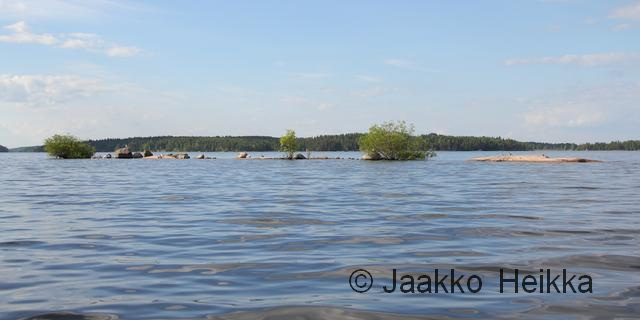 I continued paddling towards some small islands that had looked promising on the map but found them to be very densely vegetated, not meeting my idea of small rocky islet. 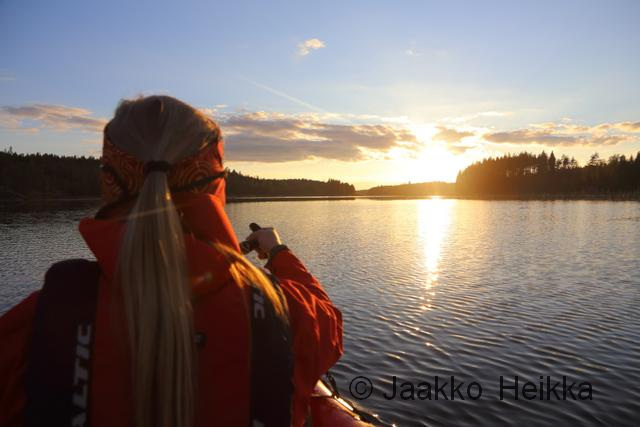 So I kept paddling as the going was good and the evening was beautiful. 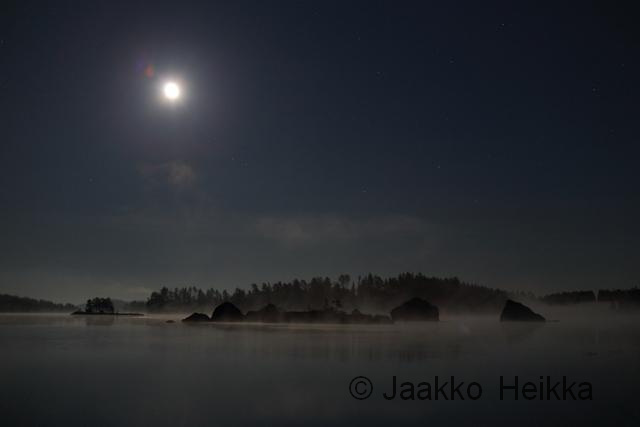 At one point I decided I should camp by 20:00, then it was 20:30 and finally it was well past 21:00 before I decided to settle on nice rocky cliffs on a bigger island. It wasn’t exactly according to the plan but the island didn’t have any summer houses nor could I spot any on the shores in the horizon and the camp was on a cool spot with great views so I declared it good enough. 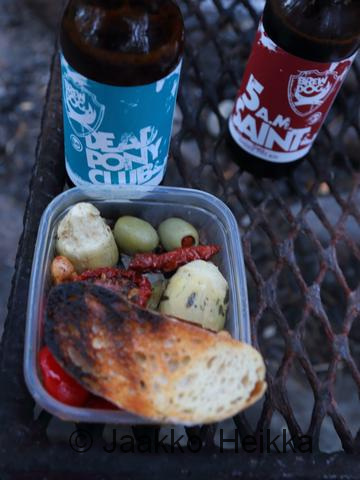 There is always something especially appealing in camping on top of a high place! 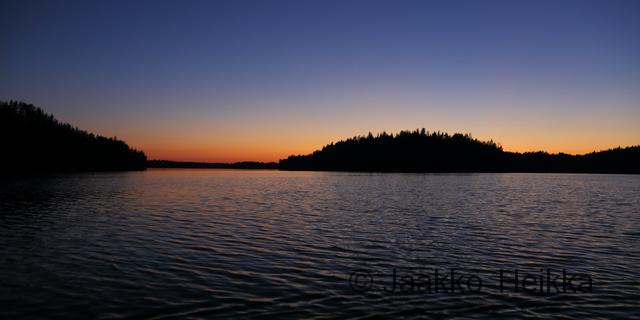 But immediately after getting ashore I noticed I would not be alone for the night: There were ants. A lot of ants. As it was late I decided to stay anyway and quite soon learnt to come along with the ants. As long as I stayed relatively still they didn’t actually climb on me or bite me that much but when moving around they got into my Croccs and started biting my feet which wasn’t very nice. 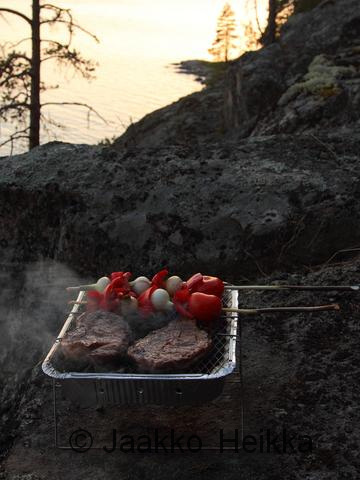 I pitched the tent, took a swim and lit the disposable grill I had brought to celebrate the mid-summer. 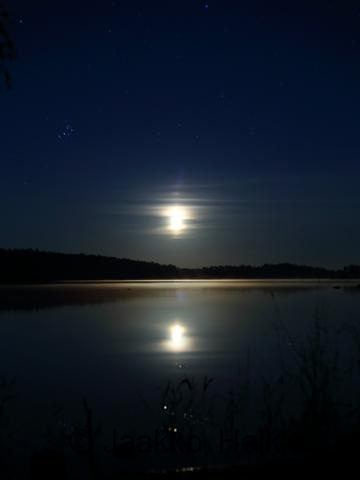 I slept well, as I usually do in the outdoors, waking to the pesky alarm that I had set for 3.20 am to catch the sunrise. What was I thinking setting up the alarm? After a quick look it was apparent that the sunrise would’ve required walking over the big rocky hill to the other side of the island so I didn’t bother and got back to sleep. After the morning chores I gathered a bit of confidence and set on the waters. 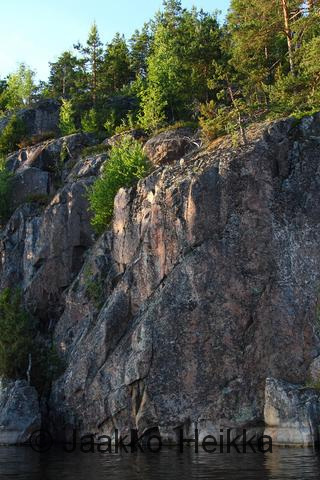 I re-checked a potential climbing rock on the shore for future deep water solo efforts. (Thanks for fellow blogger Lauri for the term.) After getting out from the shelter of the island it was evident that I’d be enjoying headwind for the rest of the day. Going was still okay but not nearly as fast as the day before. There seemed to be also more boat traffic than the day before. At one point my legs had gone past the numb phase into hurting-quite-a-lot-and-going-to-spasm-soon phase and I hurried to search for a decent place to have the first break of the day. Learning from the previous I later took couple of more breaks before arriving back to the harbour area and nearly got tipped over because of a boat speeding past me under a small bridge. Nice. Luckily I just got splashed over and didn’t even have to do any ninja moves to stay upright and dodge a bridge pillar near by. After the little drama I got back to the kayak shed and called it a day. I got the bit of solstice solitude I was looking for but I have to say I find outdoors activities more meaningful when done with friends to share the experience. 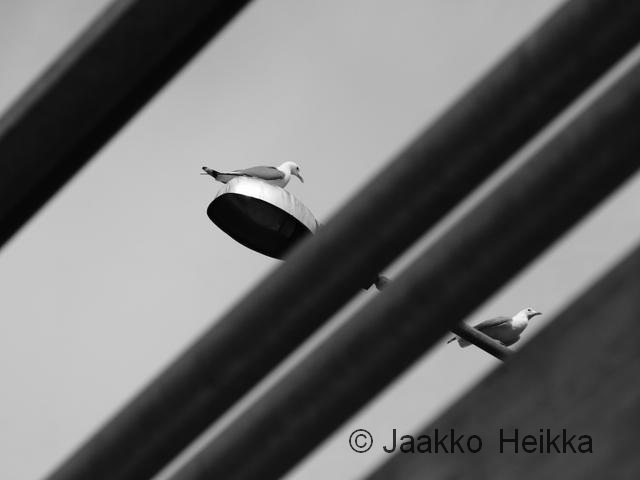 As usual, some extra photos can be found from my gallery. 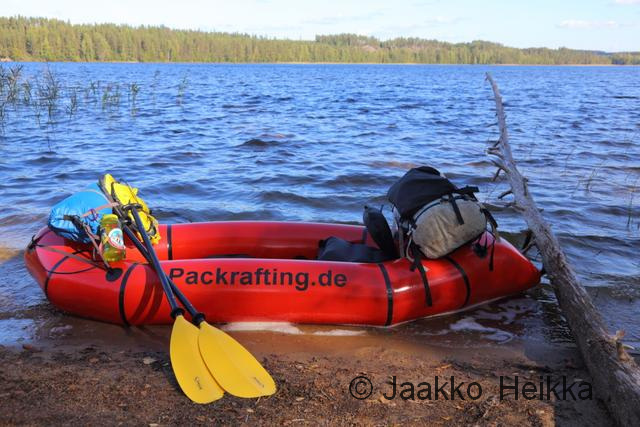 Last week’s overnighter was supposed to be a kayaking trip to lake Kuolimo in South East Finland not far from where I live. The plan was to go with T who has a kayak and I would have rented a kayak from the local club SaiLa just like before… But it turned out they don’t rent kayaks on Tuesdays! 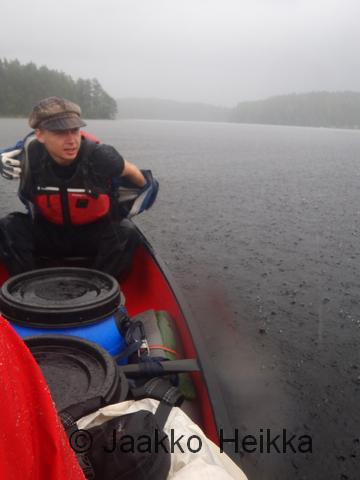 We didn’t let this stop us and instead borrowed a canoe as you got to get your outdoors fix in a way or another. 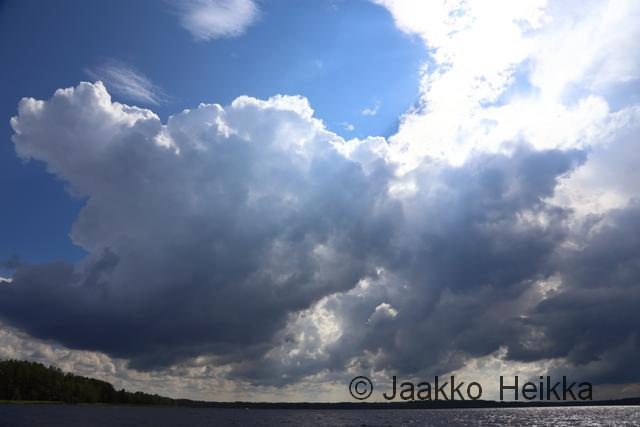 Kuolimo is an interesting little (about 80 sq km) lake located in the South-East Finland in the municipalities of Savitaipale and Suomenniemi. 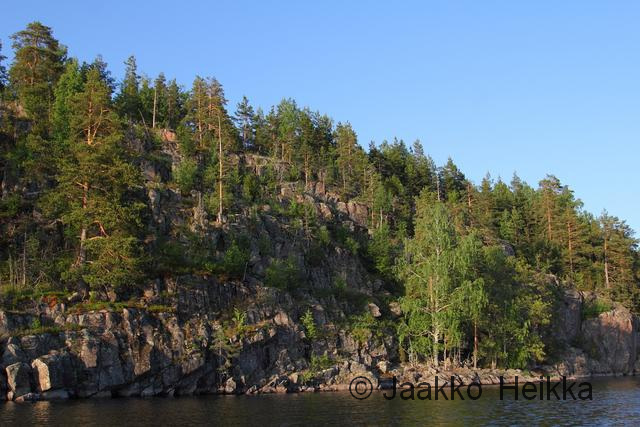 It has very clear water (unlike most other lakes in Southern Finland), quite impressive rocky shores and it drains to lake Saimaa via two narrow rocky rapids: Partakoski and Kärnäkoski. According to official information these rapids are unsuitable for kayaking or canoeing but we were able to navigate them with our canoe – though they don’t provide much white water fun. 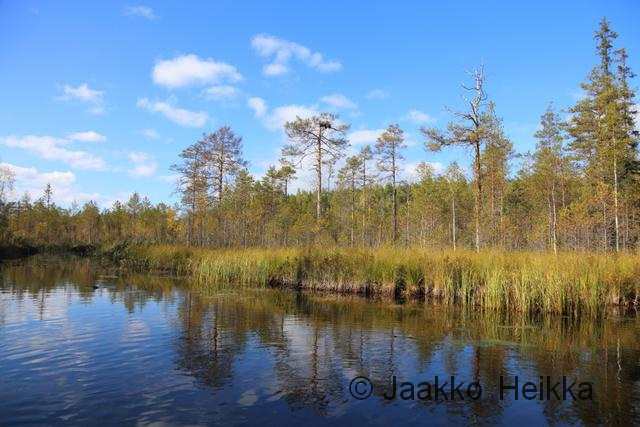 Back in the days the rapids had been cleaned from rocks for floating timber but they have been restored as there is an extremely endangered population of Saimaa arctic charr living in the lake Kuolimo. 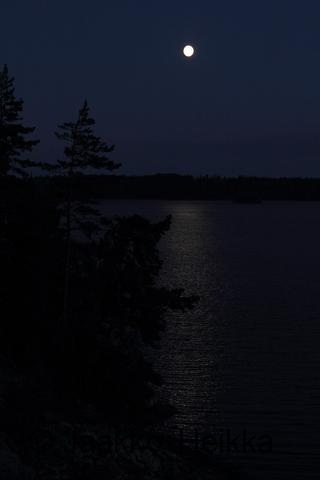 There are a couple of established nature trails at the shores of the lake, several lean-to shelter with fireplaces and also some services at the shores of the lake like the Partaranta that offers little pricey but delicious pizzas. 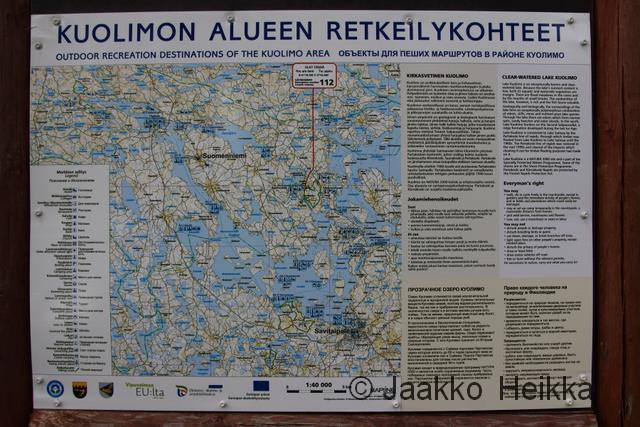 And then of course there’s the large village (kirkonkylä) of Savitaipale with abundance of services for outdoors folk passing by. 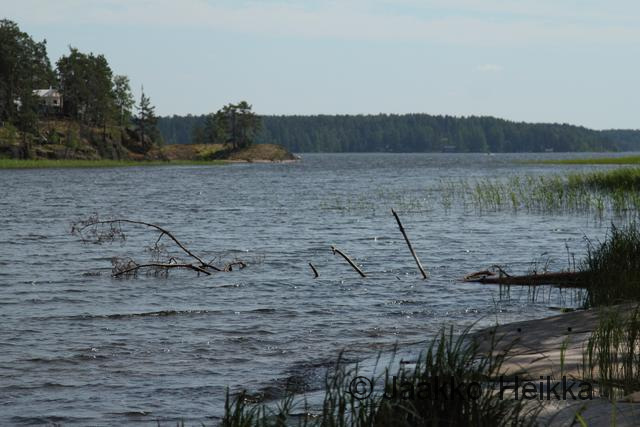 Of course there are plenty of summer houses on the lake shores so there is no feeling of a real big wilderness in my opinion – as is the unfortunate case in most of Southern Finland. 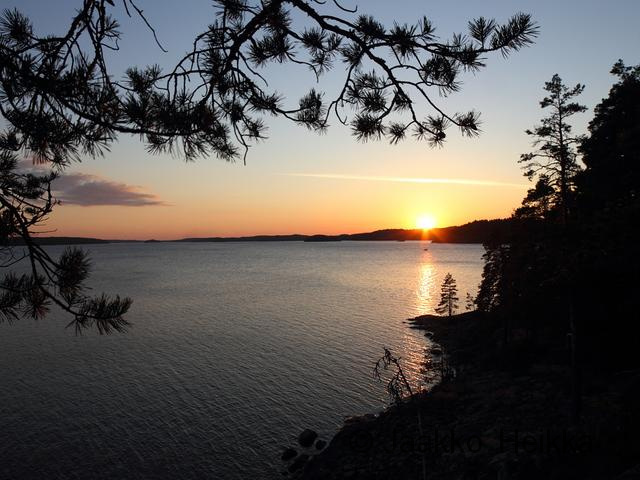 But you can always find a nice bay or strait with no visibility to cottages and enjoy the nature around you. 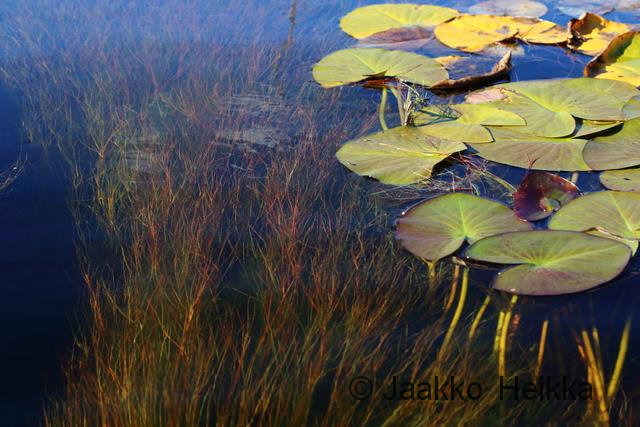 I’d see Kuolimo as a great destination for a 2-5 days canoeing or kayaking trip. On longer trip you would have time to visit the sights: walk the nature trails, visit the old fortress at Kärnäkoski, etc. 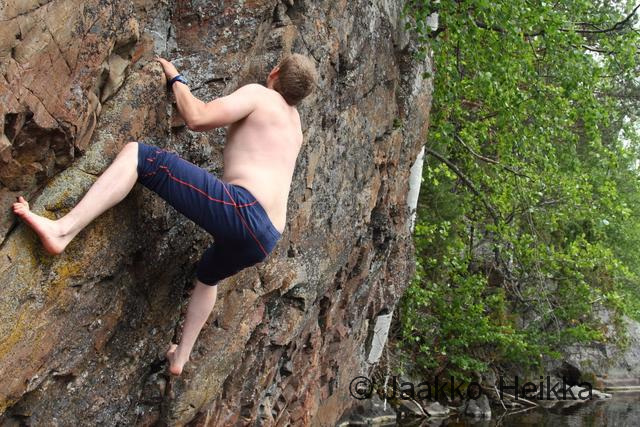 and maybe try some bouldering on the rock faces on the shores. 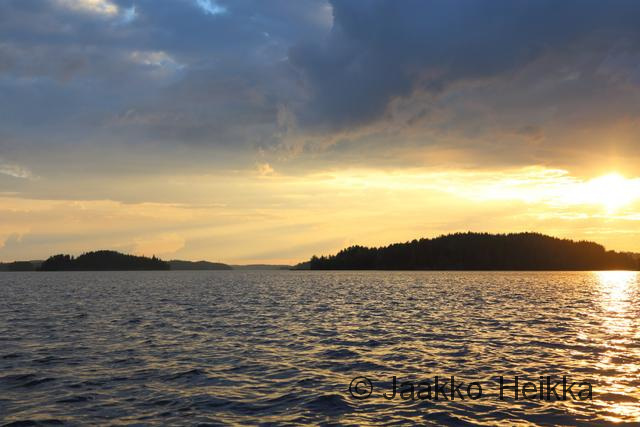 I assume there is quite a lot of boat traffic in the summer holiday season so preferably go during weekdays in the early summer or early autumn to get some solitude. 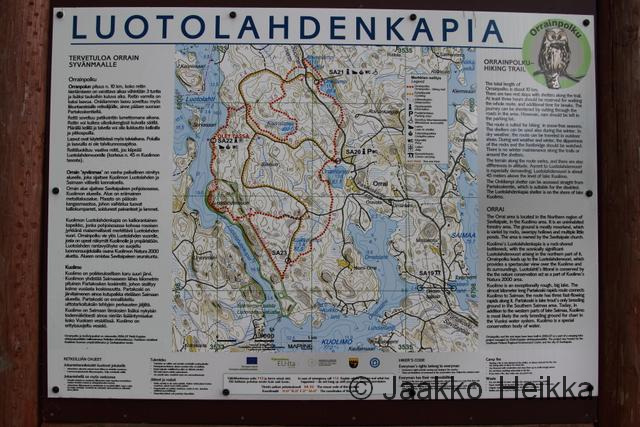 Also biking around the lake would make sense, there are even some established bike routes! 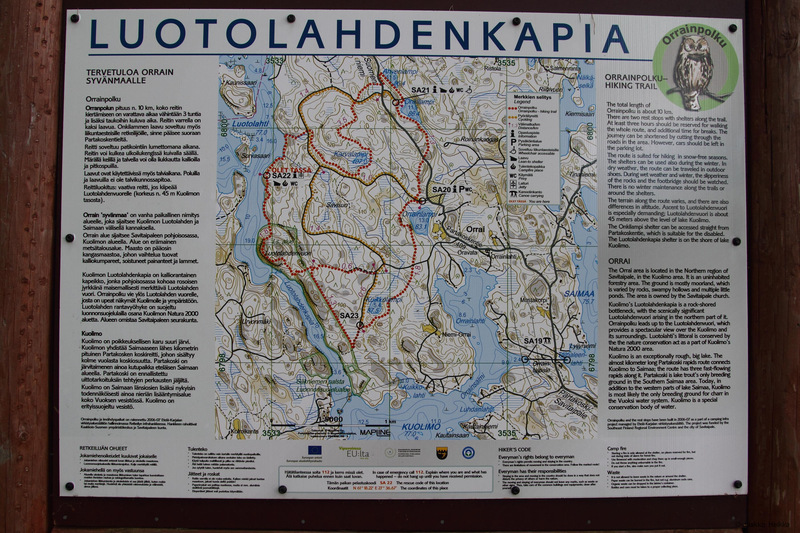 Here are high-resolution photos of some information boards along the way if you’re interested in the details. Click for a larger high-resolution version! First we paddled trough the long narrow strait of “Luotolahden Kapia” which is quite impressive place with its rocky shores. 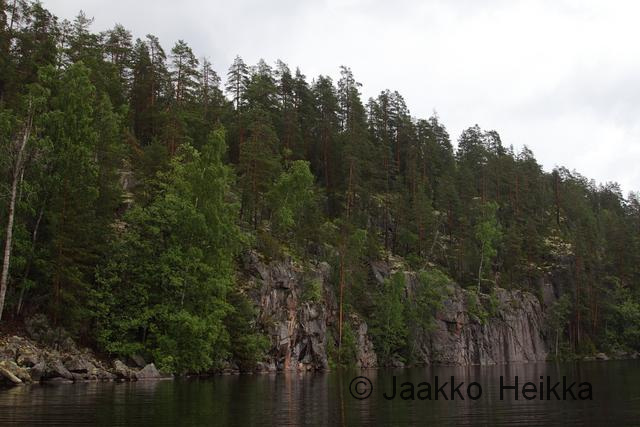 When we got on the more open waters we decided to head to Partakoski for lunch at restaurant at Partaranta. 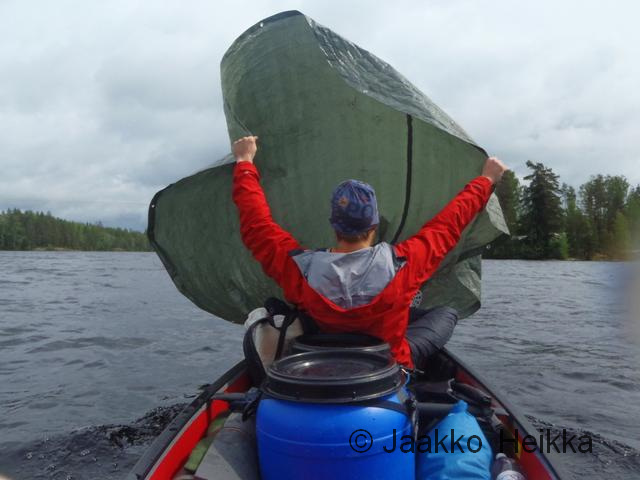 We had a rare case of tailwind so we tried some sailing and got nice speeds of 7km/h or so but the sail rigged from cheap hardware store tarp could use a little upgrade… If I’d go canoeing regularly I’d definitely sew a sail for my canoe! 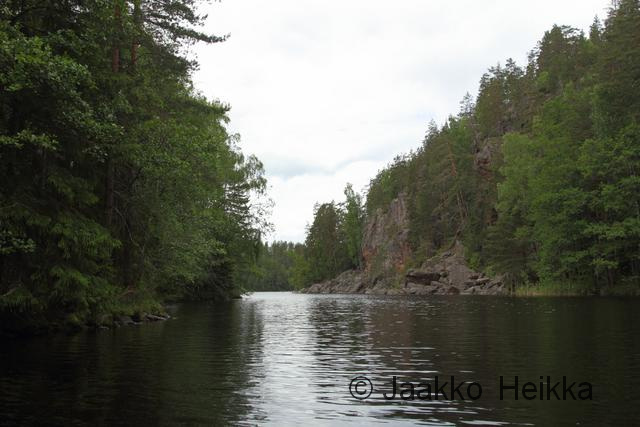 The route to the lake Saimaa down the Partakoski rapid includes three sections of rocky and narrow swift water but to our surprise those were quite easy to navigate with the canoe. They required active maneuvering and slow going but provided actually fun little challenges but were unfortunately very short. 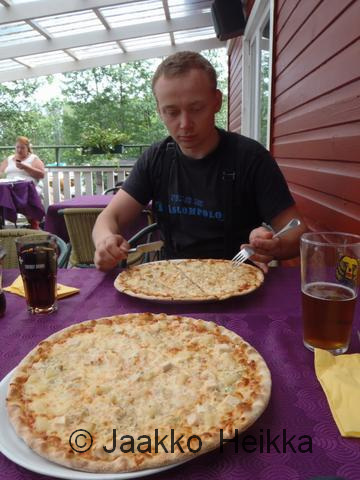 The maneuvering was rewarded with pizzas (13 euro each) and beers (small beer 4,50 euro) at the restaurant terrace were we watched the weather roll in again with a thunder in the distance and heavy rain surrounding us. 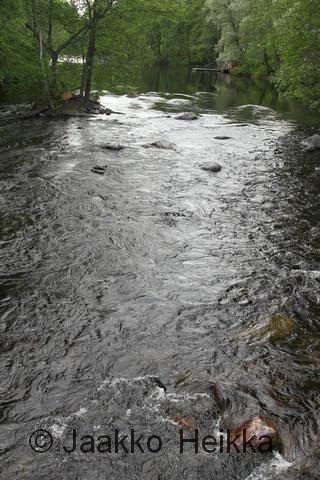 Last section of Partakoski seen from the bridge. As the rain didn’t seem to be going anywhere, we decided to take the initiative and started to paddle away from it. 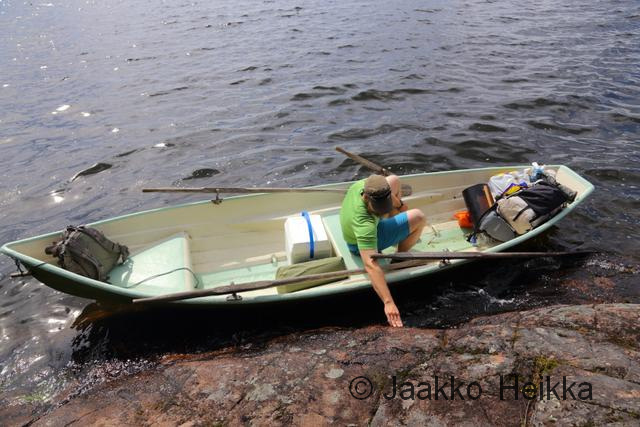 Plan was to paddle about one kilometer on the lake Saimaa and then paddle up the Kärnäkoski as high as possible and to portage back to Kuolimo. 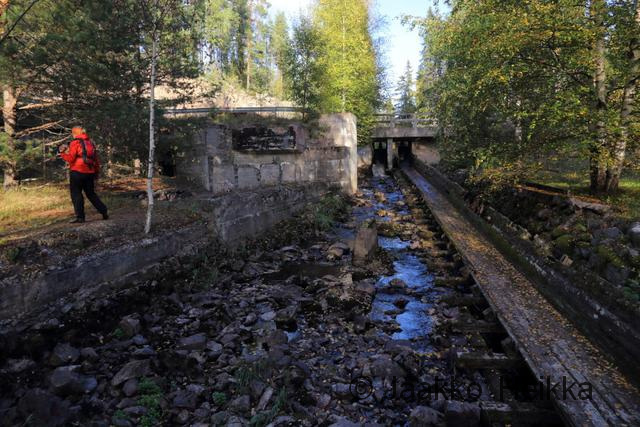 There is an old mill and a bridge with quite small passage under it with the bridge being the only sensible option to portage. 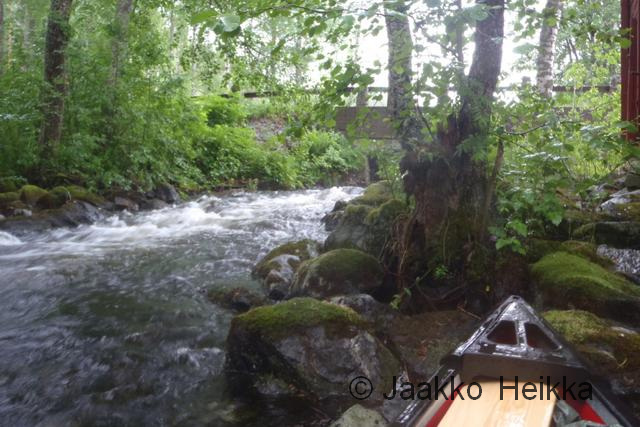 We were able to paddle up to the mill quite easily but when closing to the bridge I had to jump out from the canoe and push it upstream wading in very fast mid-thigh deep water while Tuomas was paddling and steering in the front. This was actually quite easy as the canoe offered some “cover” from the water and a support to lean against. 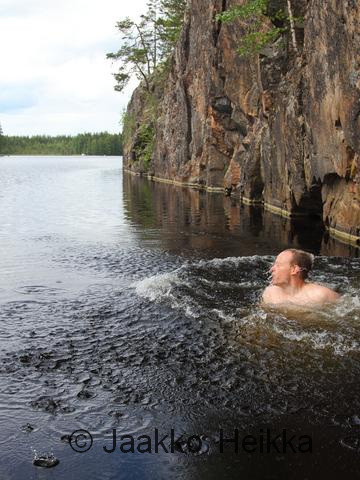 We made it trough the little hole quite easily and were back at lake Kuolimo. 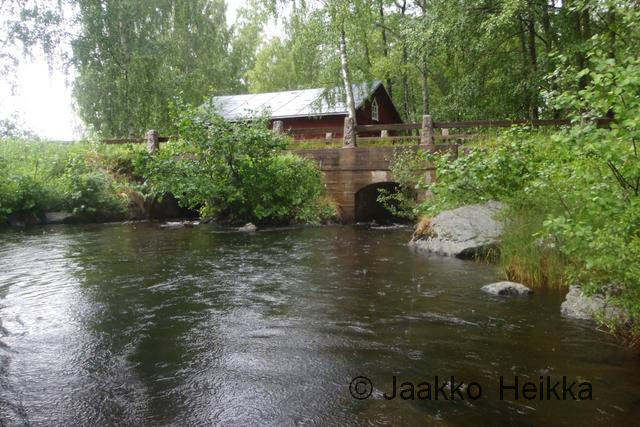 Kärnäkoski, the mill on the right, the bridge on the left. 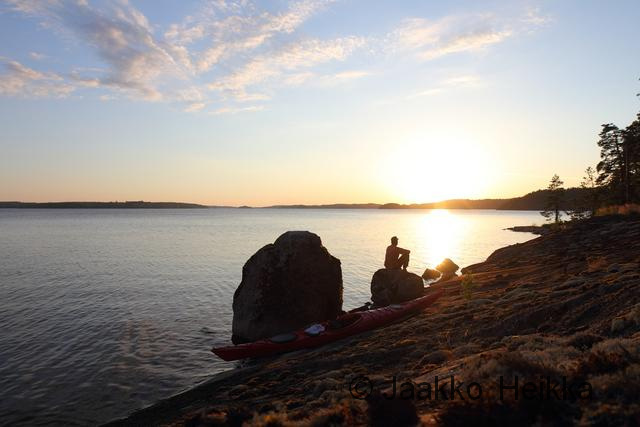 For the night we decided to paddle to a lean-to located on the Western shore of Lehtisensaari island (quite a big island of about 3 sq km that used to have permanent settlements). While the way to the Southern tip of the island was quite nice and relaxed the weather decided to throw in one more challenge for the day: rain rolled in again and after passing the tip of the island we were faced with strong wind from the West generating big waves that properly rocked our canoe. (No photos of this as I was too busy paddling…) We paddled close to the shore enjoying the rollercoaster and finally reached the lean-to. 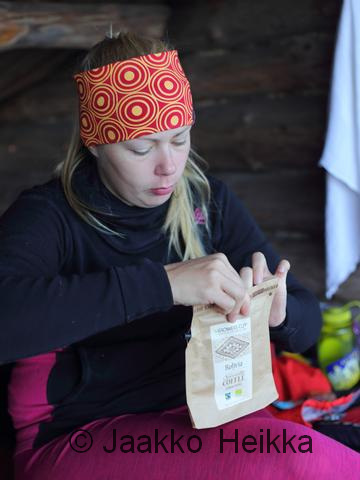 The plan for the evening was to luxury camp with some gourmet food and an improvised tent sauna. The cold showers during the way were not that luxurious but the camp proved good: The wind settled a bit but still kept the mosquitoes away, rain didn’t return and we even got a proper sunset. We reshaped the fire-place to serve as a sauna stove and started to heat the rocks while preparing dinner: bruchettas (btw the WordPress Proofreading suggest “brunettes” here but we didnät have any with us…) with Spanish style tapas and red wine for starters (as tested on the previous trip), salmon fillet cooked on a piece of wood in the glow of the fire and grilled veggies as main course (with more cheap red btu still no brunettes…) followed with Irish Coffee and marshmallows as dessert. 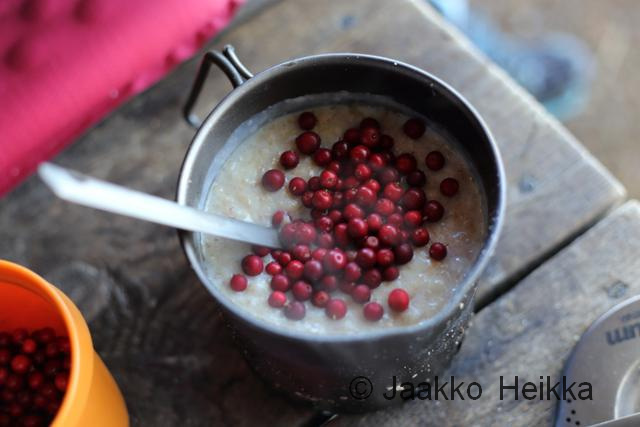 This time even the cream made it and was easily whipped by shaking it in a Nalgene bottle! 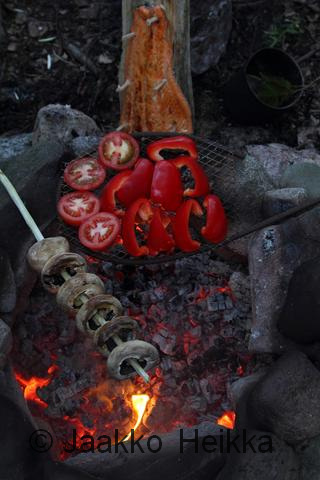 Notice the improvised-on-site cooking equipment. After the proper three course dinner it was time to improvise the sauna. 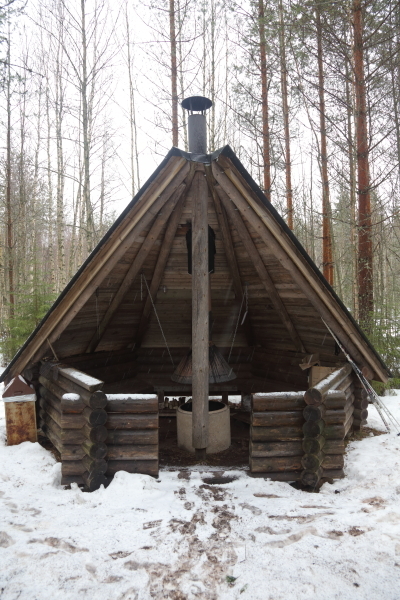 There were some slightly charred tree trunks at the shelter and we had a big tarp with us and these combined with the seats around the pimped fireplace and some pack straps made a cozy yet very functional sauna for two. (Caution! 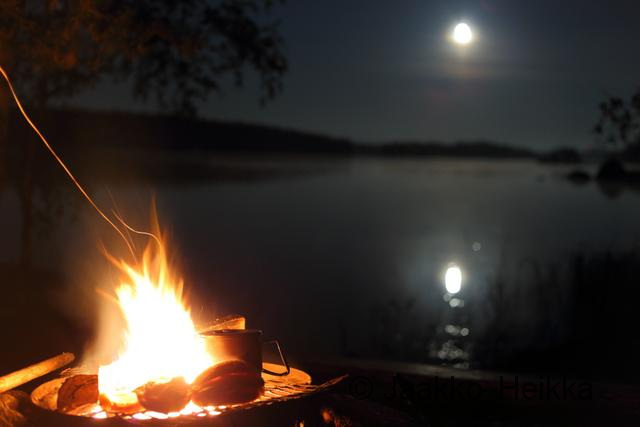 If you build an improvised sauna, remember to put out the fire properly before covering your stove with a fabric, otherwise carbon monoxide, carbon dioxide or other nasty fumes may get you!) 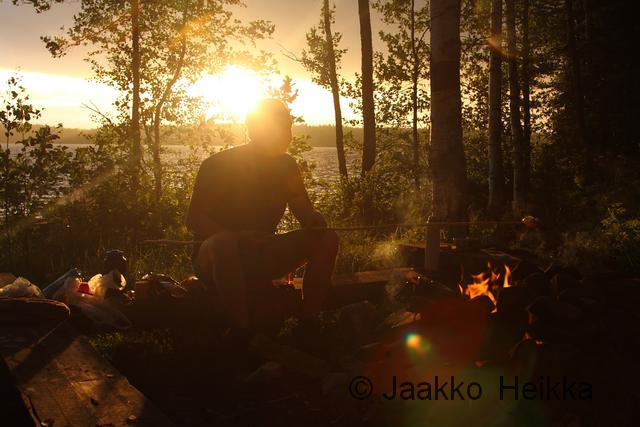 As the wind kept to bugs away there was no need to pitch the tent and after the sauna, swims and beers we retired to our sleeping bags under the lean-to. 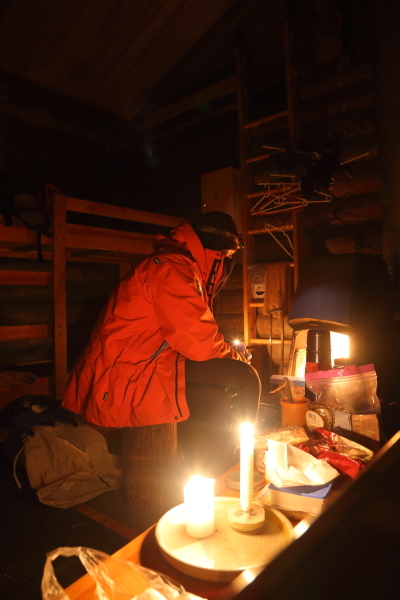 Towards the end of the trip the wind picked up again and we felt cold so we had a coffee break with roaring fire at the lean-to in the Luotolahden Kapia strait before arriving back to the car. 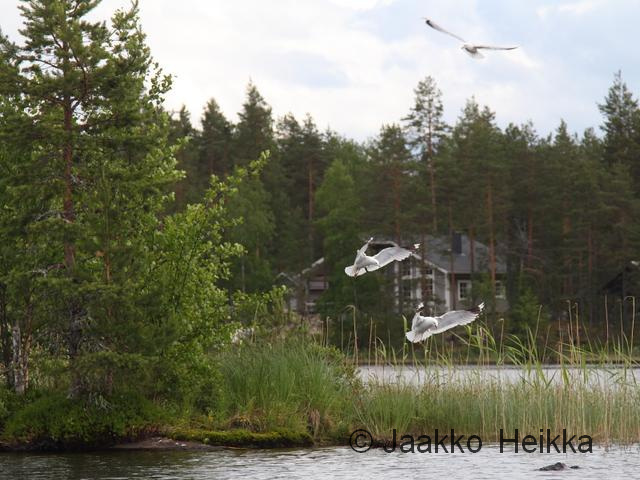 On the last bit we saw seagulls apparently trying to fend of something in the water: The birds didn’t mind us floating only 10 meters away but kept diving and hovering above the reed next to a little islet… Maybe there was a snake swimming to the nest? After admiring the airshow for long enough we paddled the last strokes back to our car and headed home. Another jolly good overnighter! PS. As usual, more photos in my gallery.